Harper very skilfully creates suspense. Small pieces of evidence accumulate, misleading clues come to light and townsfolk provide false leads, propelling the investigation towards a gripping conclusion. What really sets The Dry apart, however, is the integration of plot and setting. The town of Kiewarra is so small that it is analogous to the self-contained world of classic detection, but the hostile landscape itself remorselessly shapes past and current events, affecting every strand of the plot. Characters who engender fear seem to share in the cruelty of the landscape, and no one is untouched by “the barrenness and the scale and the sheer bloody hardness of the land”. The blowflies that swarm over the prologue “didn’t discriminate. To them there was little difference between a carcass and a corpse.” Harper’s opening horror film close-up of the indifferent flies feeding on “unblinking eyes and sticky wounds” conveys the pitiless effects of the worst drought conditions in a century: ‘”It’s a pressure cooker round here, mate. Little things become big things faster than you expect.”’ People who struggle to survive under such conditions are psychologically deformed in an environment that magnifies every feeling of anger, bitterness and desperation. 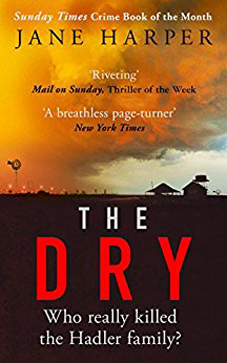 Brutal crime and the savage natural world become inextricably linked in this expertly constructed narrative, making it intense and disturbing throughout.